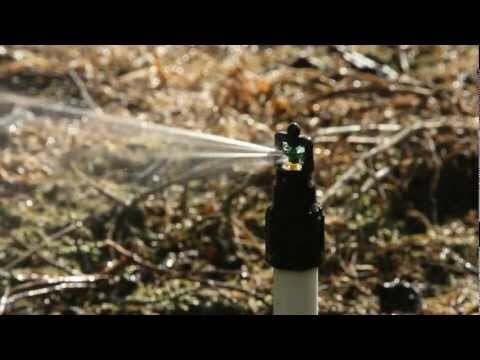 The R5 Rotator® is a micro sprinkler for Full Coverage Irrigation. It has higher uniformity, greater distance of throw, and provides better infiltration than comparable micro sprays or spinners. The flow control nozzle option is fully flow regulating at 15 psi (1 bar), while pressure compensation in other micro sprinklers begins to function at higher pressures. Low pressure options and a wide range of nozzles and accessories enable the installation of the R5 into any type of micro irrigation system. Use the blue or green R5 Rotator plates for under-tree irrigation and environmental control of tree fruit, vine, and tree nut crops. Use the wine plate to invert mount the R5 for overhead irrigation, cooling, and environmental control in tree, vine, small fruit, and nursery crops. and portable pipes including aluminum, polyethylene and PVC. Feedtube Assembly for the R5 (#40-50 or 8.5-18 GPH). Feedtube Assembly for the R5 Rotator (upright mount). The FT-02 is for an inverted mount of the R5 Rotator. FT-03 is for an upright mount of the R5 Rotator. R5 Installation Tool (#11108) is used to make installing the R5 sprinkler simple. R5 Stream Splitter (#10746) protects tree trunks. The single-sided splitter is used when R5 Rotators are mounted 2-4 feet ( 0.6-1.2 m) from a tree. The R5 Deflector Cap (#10951) is used to reduce the R5 Rotator radius down to 3-4 feet ( 0.9-1.2 m) for watering newly planted trees. The R5 Two-Sided Stream Splitter (#10976) is used when R5 Rotators are centered between two trees. R5 Female Acme Adapter (#10616) is used to connect the R5 sprinkler to Acme Adapter threads. The Acme PVC Adapter fits the R5 (with #10616), R10, R10T, R2000, R2000WF, S10, D10, R10TG. Available with 1/2", 3/4" or 25 mm inlet. The Acme x MNPT Adapter fits the R5 (with #10616), R10, R10T, R2000, R2000WF, S10, D10, R10TG. Available with 3/8", 1/2" or 3/4" inlet. Ensure high uniformity and even flow throughout your system and eliminate the effects of pressure gains and losses due to uneven topography or high friction loss.The drain check feature eliminates sprinkler drizzle during shut down and start up. Choose from 20, 30, 35, 40, 45, 50 or 60 PSI (1.4, 2.1, 2.4, 2.8, 3.1, 3.4 or 4.1 BAR) nominal pressures. For systems in which pressure ranges are excessive, the Nelson Mini Regulator provides uniform flow and distribution at each sprinkler through pressure regulation. Ensure high uniformity and even flow throughout your system and eliminate the effects of pressure gains and losses due to uneven topography or high friction loss. Choose from 20, 30, 35, 40, 45, 50 or 60 PSI (1.4, 2.1, 2.4, 2.8, 3.1, 3.4 or 4.1 BAR) nominal pressures. The MDC is a check valve only that opens 2-5 PSI (.14-.35 BAR) below the nominal pressure rating. Available in 20 and 35 PSI (1.4-2.4 BAR) options. Ideal when a check feature only is needed or when it is necessary to operate sprinklers at different pressures that best suit environmental conditions. Perfect for overhead cooling of apples and other crops. The MDC prevents draining of the system in between frequent on / off cooling cycles. Threaded Cap for Acme Adapter (#10615). The Female Acme 1/2” PVC Spigot (#10352) enables easy attachment to a PVC riser.